F&W rounds up the best dishes (think spicy lemongrass chicken and smoked salmon-stuffed puffs) from museums country-wide. Chicken is popular among the Duke faculty, many of whom eat Amy Tornquist's dishes at the Nasher Museum of Art in Durham, North Carolina, daily. 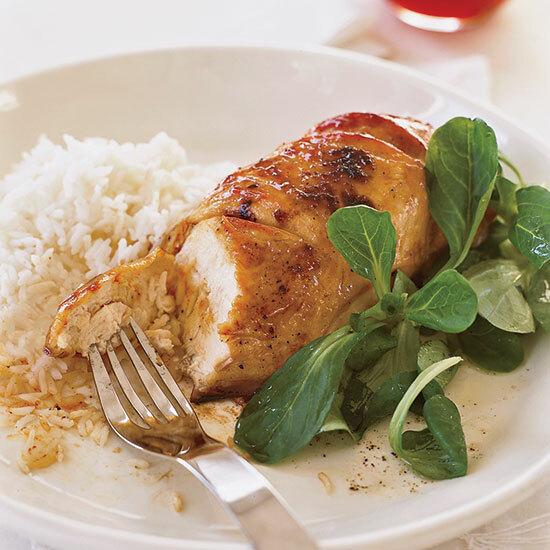 To satisfy their appetite for something new, Tornquist came up with this recipe for honey-and-spice-glazed chicken. A touch of cayenne pepper adds kick. Classic eastern North Carolina barbecue sauce has a vinegar—not a tomato—base. Amy Tornquist tosses it with pulled chicken instead of the usual pork. A classic French remoulade is usually prepared with homemade mayonnaise. 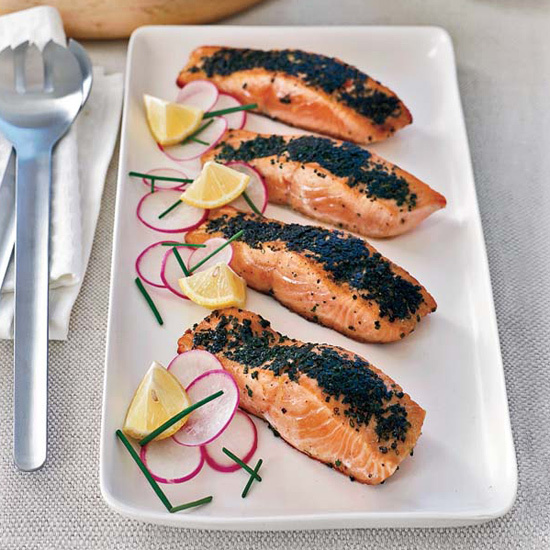 The recipe by Amy Tornquist here calls for the store-bought kind, combining it with capers, apples and celery. Charles Phan prefers tender baby bok choy but if you can only find mature heads, separate the leaves from the stems, cut the stems into 1 1/2-inch pieces and stir-fry them separately so the leaves don't overcook. Phan and Loretta Keller, the chef and owner of Coco500, run two restaurants, the Academy Café and the Moss Room, at the California Academy of Sciences in San Francisco. Charles Phan has firm opinions about the right and wrong way to stir-fry. 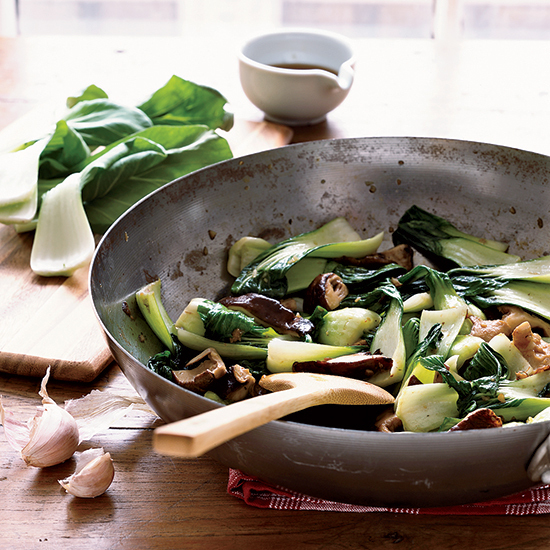 "A wok isn't like a salad bowl with a flame under it. You don't want to throw everything in at once and toss. 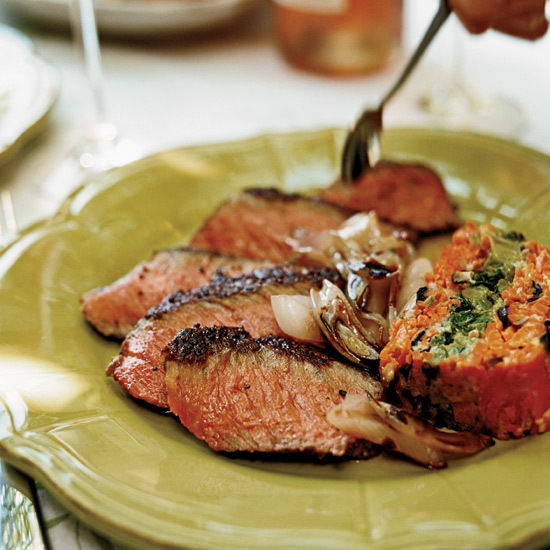 You need to layer flavors by adding ingredients in the right order." 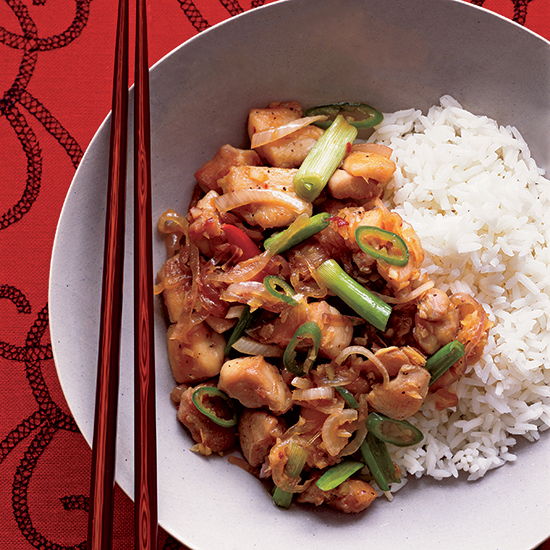 That's why he stir-fries the chicken here by itself until it is deeply golden and juicy before he transfers it to a plate; after he finishes cooking the other ingredients, he returns the chicken to the wok so all the flavors meld. Wolfgang Puck became adept at preparing accessible Asian-flavored dishes at his restaurant, Chinois on Main, which he opened in Santa Monica, California, in 1983. His sweet-and-savory Asian-inspired sauce, which is flavored with hoisin, ginger and soy sauce, is delicious with the tender grilled beef. Puck now has restaurants at the Walker Art Center in Minneapolis and the Newseum in Washington, DC. 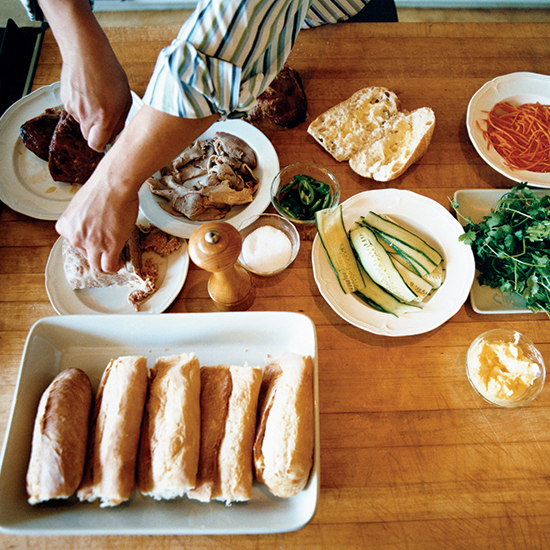 Charles Phan thinks these French-Vietnamese sandwiches, banh mi, "are fusion food at its best." This particular recipe is inspired by a tiny sandwich shop Phan happened upon in Hoi An, Vietnam, that stays open until 4 a.m. Not only does the owner of the shop make his own pâté, he also soaks his pork overnight in a garlicky brine before roasting it, as Phan does here. In 2004, Gabriel Kreuther an F&W Best New Chef, opened The Modern inside New York City's Museum of Modern Art. 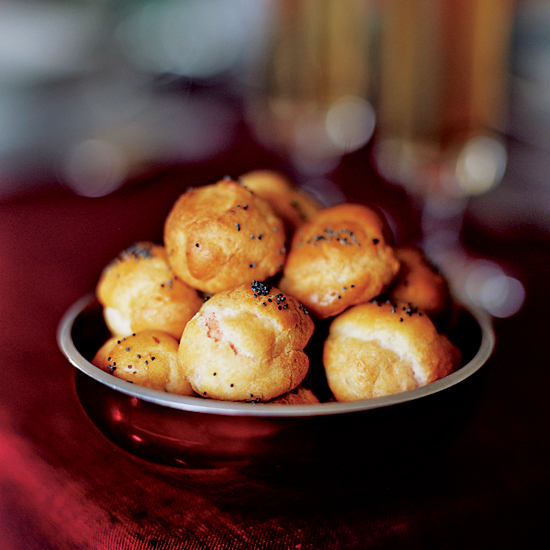 For his smoked salmon-stuffed puffs, the unfilled baked puffs can be frozen for up to 1 month; recrisp in a 325° oven. The filling can be refrigerated for up to 3 days. 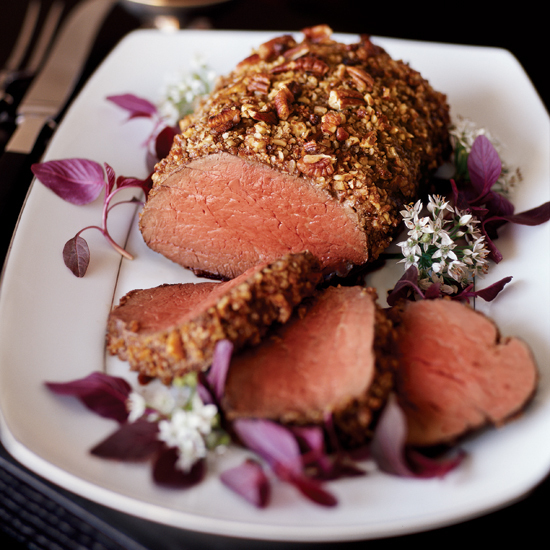 A full-bodied red will echo the juniper-berry jus and the rich pecan coating on this beef tenderloin by Gabriel Kreuther.